Saturday, Sept. 9: EAST CATHOLIC, 1 p.m.
Saturday, Sept. 16: TOLLAND, 1 p.m.
Friday, Sept. 23: RHAM, 1 p.m.
Friday, Sept. 29: at Bloomfield, 7 p.m.
Saturday, Oct. 7: at N.W. 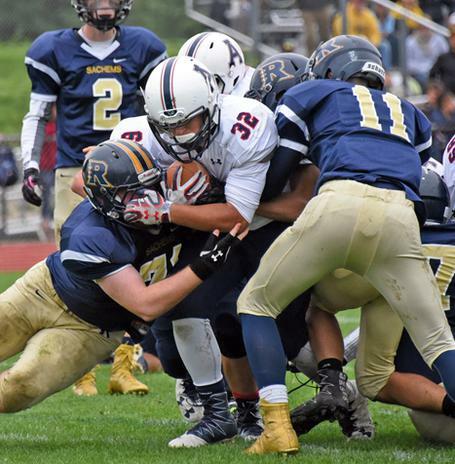 Catholic, 2 p.m.
Friday, Oct. 20: at Berlin, 7 p.m.
Saturday, Oct. 28: BULKELEY/HMTCA/WEAVER, 6:30 p.m.
Friday, Nov. 3: at Rocky Hill, 7 p.m.
Friday, Nov. 11: PLAINVILLE, 1 p.m.
Click here for the latest CT High School Football record book. 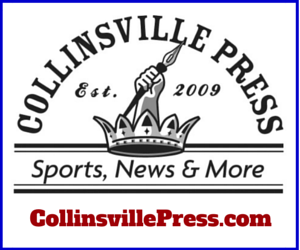 AVON -- Look to the Collinsville Press for the latest news and information about the the Avon High football team. 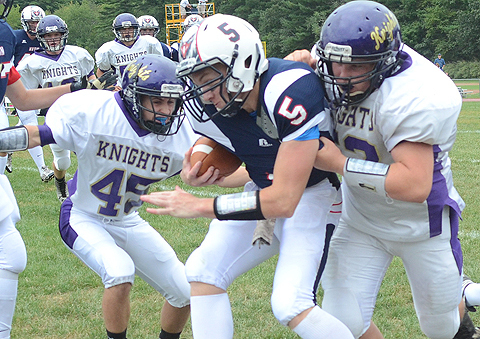 n Avon’s Ian McDonald (5) gets stopped by Ellington/Somers in a 2014 contest in Avon. 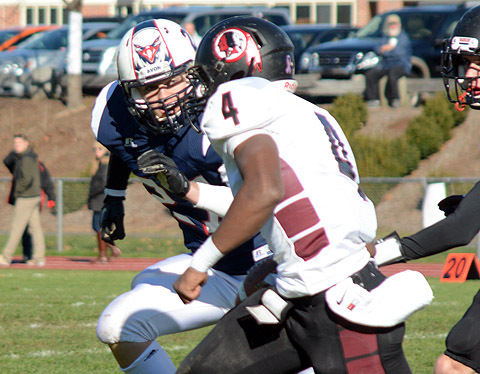 n Avon's Jake Corrigan closes in to make a tackle against Valley Regional/Old Lyme in 2014. 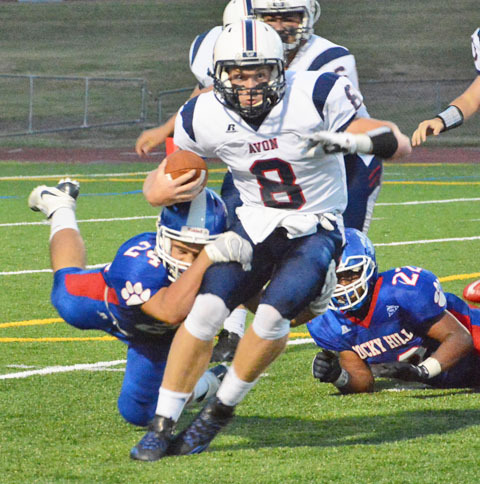 Avon QB Ian McDonald breaks a tackle in a 2015 win over Rocky Hill. The Falcons won their first-ever CCC contest, 27-0. 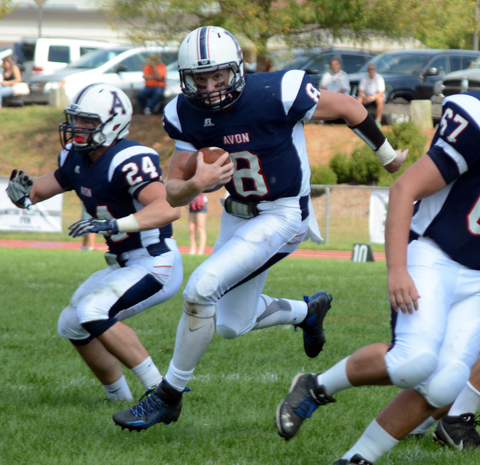 Avon's Ian McDonald (8) looks for space to run during the 2015 campaign. 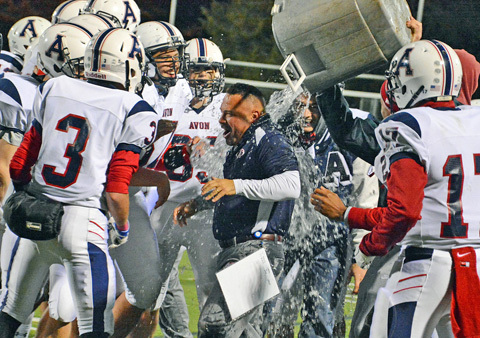 Avon High coach Jim Caouette gets a celebratory shower after the Falcons beat Berlin in 2015 for the first time since 1983 with a 21-14 victory at Sage Park. Geoff Kirk moves toward the end zone to score a touchdown in Avon's 41-12 win over Rockville to win the CCC Div. 3 East title in 2015. 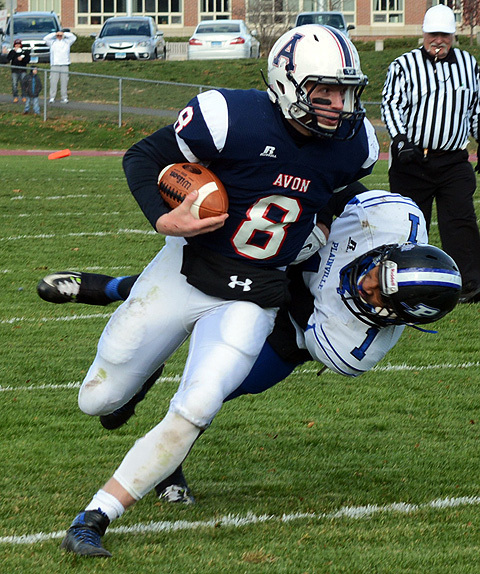 Avon's Ian McDonald carries a Plainville defender in a 35-14 victory over the Blue Devils in 2015. 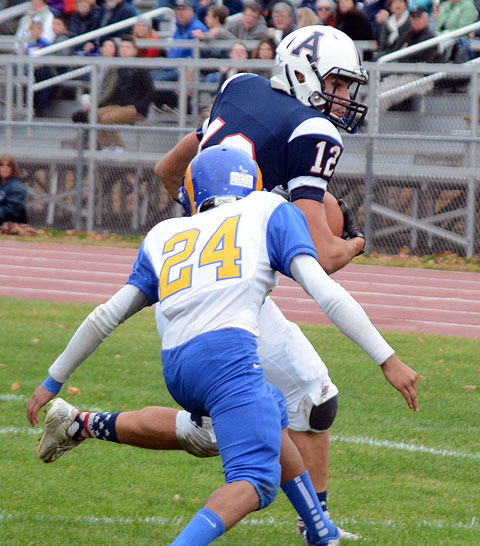 Avon QB Ian McDonald and the Falcons face Simsbury in front of a big crowd in the first Valley Gridiron Classic in 2015. 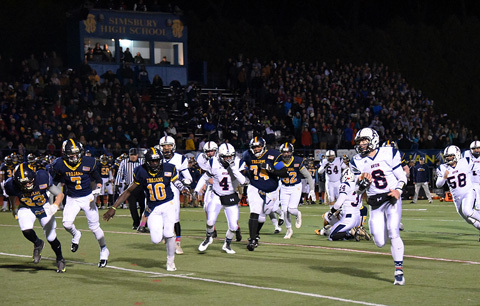 Avon's Leon Asberry rushes for yardage against RHAM in 2017.